There is no denying that stir fries are the most classic type of dish when it comes to chopped chicken and crispy vegetables. They’re simple to make and can be done in minutes. This Easy Stir Fry Chicken Recipe is no exception. Whether you’re preparing this dish in a wok or a large saute pan, the end result is pure deliciousness. For this recipe, no fancy kitchen gadgets or tools are required. Just a wok or large saute pan and tongs will do the trick. Tip #1: Let the oil in your pan get really hot before adding your chicken as this will allow for a really nice sear. Tip #2: Crowding your saute pan will steam your chicken instead of searing. To prevent this from happening, sear your chicken in batches if necessary. Tip #3: Refrain from constantly checking your chicken as this will interrupt the searing process. Try not to get too anxious. Let your chicken sizzle for about 6 minutes on both sides. This will allow for a nice golden and crispy outer coating. 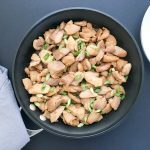 This step is very important as the brown bits that adheres to the pan adds additional flavor for the next steps in this Easy Stir Fry Chicken Recipe. Tip #4: Preparing a sauce adds so much depth and added flavor which I highly recommend. Again, as the name implies Easy; therefore, aim for an easy sauce. Scroll down to the recipe box below that describes the sauce that I prepared for this recipe. Tip #5: Because this Easy Stir Fry Chicken Recipe is so versatile, it can be served alone over rice or stir fried with all sorts of veggies ranging from peas, carrots, mushrooms, broccoli, this list goes on. Tip #6: If you decide to add fresh veggies to your chicken stir fry, I would suggest that you prepare your veggies first being mindful NOT to overcook and set aside. You want your veggies to have a little bite by remaining crisp and not soggy. Add your veggies to the pan of chicken and toss making sure to coat the chicken and veggies in sauce. On the other hand, if you’re using frozen veggies, simply add the frozen veggies from the bag and toss coating the chicken and the veggies in the sauce. Tip #7: Go for boneless skinless chicken thighs rather than chicken breast if you want moist chicken. 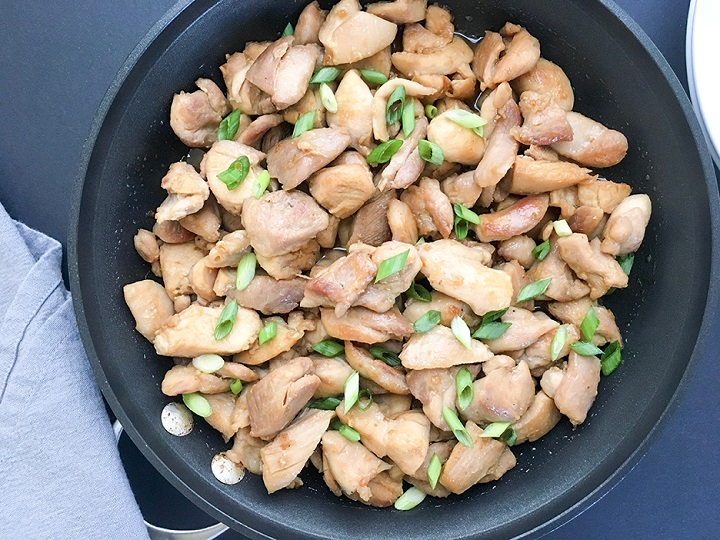 If you’re looking for a quick healthy dish, this Easy Stir Fry Chicken Recipe is a sure winner. You get your protein and reap all the benefits of serving this dish with brown rice and/or veggies. This Easy Stir Fry Chicken Recipe is simple to make and is coasted in a flavorful sweet garlic-ginger sauce. The garlic-ginger combination adds a little twist on the traditional teriyaki sauce that will wake up your taste buds in the most pleasant way. Prepare brown rice according directions on packaging. Add ingredients for the sauce in a mixing bowl and whisk. Set aside. 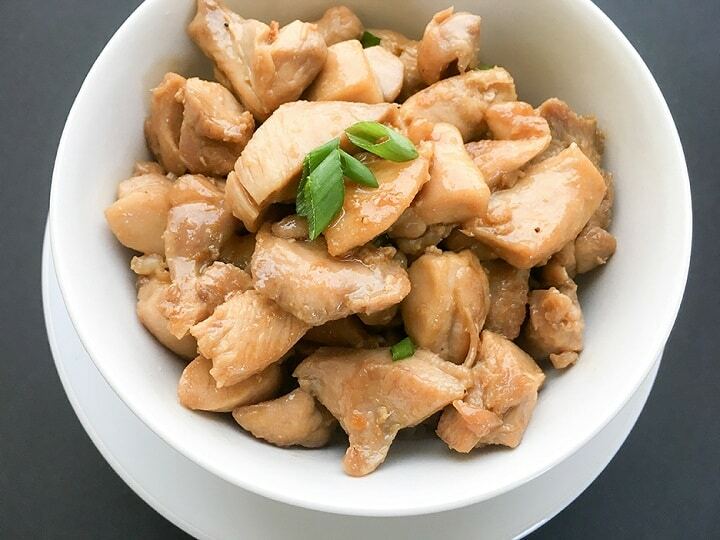 Wash and trim fat from boneless skinless chicken thighs. Pat dry with paper towels. Dice clean chicken into bite-sized pieces. Season with salt and pepper. Add olive oil to wok or saute pan over medium high heat. When pan is hot, add your diced chicken to pan in batches. (Sear your chicken in batches to prevent over-crowding in your pan. Over-crowding your pan will cause your chicken to steam and not sear). Sear both side for about 6 minutes on both sides or until chicken is golden in color with a crispy coating. Remove from pan onto a plate. Set aside. Perform these same steps on the next batch of chicken until all the chicken is seared and put on a plate. Lower heat and deglaze pan with sauce mixture and whisk until brown bits are know longer adhering to bottom of pan. Let simmer until sauce has thickened. Add cooked chicken back to pan and stir until chicken is coated with sauce. Garnish with green onions (optional) and serve over brown rice. Refer to Tips I've outlined above if you'd like. Feel free to add your choice of veggies. If you like a more saucy stir fry, double the recipe.